Road Trip, at last! Granted not an epic road trip, like many eons ago when I was but a youth, days when I could drive straight through from Ohio to New Orleans in one magnificently insane eighteen hour long expedition. And that was back before there was a Starbucks on every corner, before Red Bull gave you wings, when the only caffeine you were able to score was from pots of dark, black, bubbling crude in truck stops. The kind of stuff that would simultaneously sear your throat lining while corroding a hole through the lower intestine. The caffeine only played a small part in keeping you awake – it was mainly the pain that kept you going. Anyway, those days are far behind me, is most of gastrointestinal system. Now we drive in comfort, granted that comfort is a sedan, although we did plump for the retractable hard top. October in central California and all, so we figured to take advantage of the sun and the smog. It’s already snowed three times back home in Colorado, so why not one last glorious sacrifice of skin cells to the Sun Gods? As an aficionado of the road trip I have to say the drive across the state from Napa to Yosemite Valley, is for lack of a better term, boring. Very boring. Also somewhat tedious, a bit dull, with however, a small serving of monotony to help keep things from getting interesting. Our journey along smaller state highways, with at least one diversion along gravel farm roads, meant that we missed out on the big city lights of Stockton and Modesto. Something else I guess I’ll have to add to the bucket list. Now entering the foothills of the Sierras, and then Yosemite Valley itself, that was pretty awesome. Pretty much made up for the industrial agricultural landscape we drove across. Outstanding! Nice mountains, though not quite up to Coloradan standards, but pretty in a stunted and diminutive manner. We decided early on, while planning the trip, to make a stay at the Anwahnee Lodge, a highlight. We’re busy trying to add as many of the old National Park Lodges to our book of trip memories as we can. 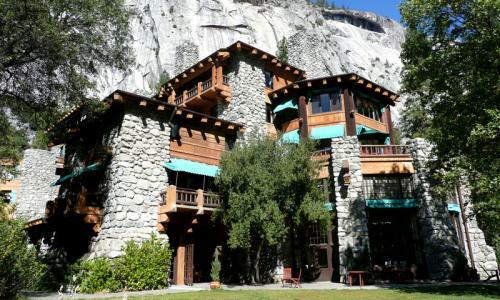 Anwahnee Lodge is one of the more famous park lodges and it’s been on our stay-at list for quite a while now. The lodge itself consists of a massive main building, with some detached cabins back in a pine grove at the rear. I reserved a cabin because of the privacy and well, I’m of the firm opinion that when offered a chance to stay in a cabin one should take it. Unless of course, it’s one of those cabins where you meet the Evil Dead, or cannibalistic hillbillies. Not that that’s something that happens very often on National Park land, I just want to make that clear. When we arrived the cabin wasn’t quite ready, a bit surprising as it was after five, and interestingly enough they were apparently replacing all the soft goods, linens, towels, and so on. We thought that a bit unusual, but figured if that’s what they did every day for each of the rooms, no wonder they weren’t all ready by evening. We dropped off our luggage and went in search of the bar, to absorb some of the historical vibes, as well as a couple of stiff martinis. When we returned to our room, Mary took one step inside and exclaimed, “Sweet baby Jebus, a skunk has extensively odorized the cabin!” Though not in quite those words (I believe there may have been substantially more profanity involved) and at a much higher volume than is easily conveyed in print. Although the staff had done their level best to try and remove the smell, it was apparent that it was going to take a lot more work to completely eliminate the scent. I think they’ll eventually have to go with a flamethrower, but then the flamethrower is the average guy’s answer to many of life’s problems, or it would be if our wives would allow us to have one. I count myself lucky to have at least a chainsaw, and I’ve used that to solve a couple of issues that would probably have been better resolved though less destructive means. But where is the fun in that? Anyway, Mary got our butts moved post haste to a room in the main building for the evening and we were assured that another, less odiferous cabin would be available on the morrow. On the other hand, we spent the rest of the stay at the lodge as minor celebrities, forever after known as the “Oh, that was you” couple.